George Osborne, in India to meet Narendra Modi, the country’s recently elected prime minister, has announced that a statue of Mohandas K. Gandhi – “father of democratic India” will be erected in Parliament Square. 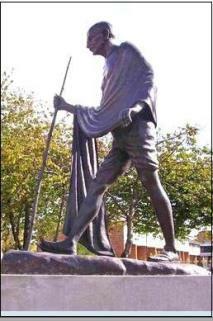 True, there is a more active democracy in India, with regard to voter turnout and respect for the grievances of the poorest when expressed en masse, than in England – but conditions in both countries make a mockery of Gandhi’s teachings: frugality, honesty, self-sufficiency, satisfying and worthwhile employment for all – qualities and opportunities notably lacking in both countries today. Gandhi – a leading figure in the Indian movement for independence – would have vigorously opposed the ambitions of the growing number of western officials in New Delhi, noted by the Financial Times, who are seeking to establish formal contacts with Mr Modi’s new administration, ‘amid revived global interest in India and its economic and strategic prospects’. What is this visit about? One aim is to persuade India to import as much as possible, with the most important proposal being, in Osborne’s words, a financial partnership – with London playing a leading role as a gateway for Indian firms to access global capital markets. The writer often wondered what Gandhi would have said to the placing of his picture on India’s banknotes – but that reaction would have been mild compared with his response to the proposals from foreign ambassadors currently on the table. Ambassadors Hague and Osborne are among visitors from several countries representing the interests of arms manufacturers hoping to redress India’s ‘shortfall’ in spending on importing weapons, about £3.5bn last year, which is – in their opinion – a fraction of its genuine requirement. Just what the people of India need? A consortium, including BAE Systems the British defence company, is hoping to secure the sale of its Eurofighter Typhoon jets to India – if its French competitor Dassault fails to secure the contract. But India has the expertise and resources to conduct its own financial affairs, defend its own country, produce its own goods and feed its own people. The new prime minister can develop this potential – or India can become just another market for imported goods and services.